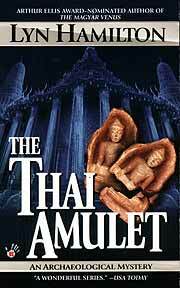 The Thai Amulet (ISBN 0-425-19487-6, Berkley Publishing 2004) is one of a series of thrillers written by Canadian author Lyn Hamilton. They have the common thread of archeology, but you should not be put off, thinking this refers to old stuffy books and million year old pieces of bone. In this book, her heroine Lara McClintoch, an antiquities dealer, goes to Thailand to accompany her partner’s daughter who is meeting the rich Thai family of the girl’s boyfriend. Since she was going to Bangkok, she was also asked if she would look up another Canadian antique dealer, who seemed to have dropped out of public view. This man had left behind a wife and child in Canada, and whilst some males in this country have ‘fled the scene’ to join others similarly fleeing, there was doubt that this was the case. Especially when the deserted wife receives a mysterious package with peculiar notes and a couple of broken Thai amulets. Lyn Hamilton has done her homework reasonably well, particularly in her research into rich Thai families, their lifestyles and the infighting. As in all societies, there’s nothing like a good death in the family to bring the sabers out of their scabbards. While many ‘old’ families also like to keep the ‘purity’ of the bloodlines intact, there are just as many that have more than a little murkiness in the past, but it is amazing what a difference a large pot of gold can do to clean things up a little. Buying respectability is an art form in SE Asia, is it not? The book steps up the pace in the latter half, as a few more bodies begin to turn up, and not all of them cold; however, the intuitive Lara manages to find all the threads and tie them together very successfully. The book should be available in all good bookstores, and Bookazine informed me that the RRP for the paperback is B. 295. I also enjoyed the parallel story of intrigue in Ayutthaya from centuries before, with which she introduced each chapter. A novel approach, and also very interesting. In fact, I could have done with more. The Thai Amulet is a good, cheap read, but is one that can be picked up and put down at will. I enjoyed it on my AirAsia flight to Chiang Mai, other than the fact that in a bid to save fuel or something equally as fatuous, they turned off the cabin lights for half the journey! Perhaps by paying more you get reading lights. I must inquire! Queen was formed out of the wreckage of a smile in 1971. Brian May (lead guitar with a penchant for playing with a sixpenny piece instead of a plectrum) and Roger Taylor (a young jazz drummer with an inkling for funk and rock) had just found themselves out of any form of entertainment due to the demise of their band ‘Smile’. They met a certain flamboyant buck toothed kindred spirit in Faroukh Bulsara (from here on known by his stage name of Freddie Mercury, in part named after the puppet hero in the Gerry Anderson’s Television show ‘Fireball XL5’), who, too, had just split up his own band ‘Wreckage’. After a bit of a Spinal Tap situation with bass players, the trio finally managed to acquire John Deacon to fill in the lower notes. You could not imagine four more unlikely people to form a band, but success was only a kiss away. After 18 months of constant rehearsal and very few actual paid gigs, the group now known as Queen was signed on a small budget by EMI Records in early 1973. Such was EMI’s disregard for their newly acquired band that they did not even book them any studio time. This Queen’s debut album was actually recorded in down time at London’s Trident Studio’s in-between other - considered more important - acts doing their own recording. According to legend, Queen found themselves spending 90% of their time sitting outside recording studios waiting for the old pros to get fed up with their 30th overdub and go home. Then the fledgling Queen could rush into the studio and lay down their debut masterpiece. It was not quite glitter all the way though. The only release of Queen’s that did not instantly hit pay dirt was their first single ‘Keep Yourself Alive”. Amazingly, this did not even dent the British Top Fifty, but it still remains this dog’s favorite single from the band. Yes, I know about Bohemian Rhapsody, etc., but I implore you listen to the vibrancy of their first single, indeed the whole of their debut album. ‘Keep Yourself Alive’ and ‘Liar’ were to remain stage favorites with the fans right till the end. 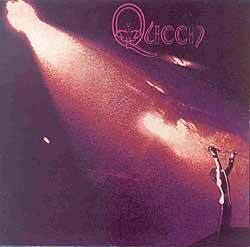 Queen’s debut album kicks off with their aforementioned single and carries on in ground breaking fashion. Fortunately, right from the first album the fifth member of Queen was behind the mixing desk. John Roy Baker was to become as essential to Queen as George Michael had been to the Beatles, funneling their natural talents into the perfect sound and working as judge and jury in inter band conflicts. Rock ‘n’ roll was built on anger and you cannot have such a multitalented band without the odd clash of ego. In many ways life in Queen was much simpler in the early days when they were scrambling their way to the top, with Freddie Mercury writing the more flamboyant storyteller songs and Brian May being responsible for the serious heavy metal side of things. John Deacon and Roger Taylor were later to write many of Queen’s classic songs, but on this their debut album John Deacon is confined to playing the strong silent bass player, while Roger Taylor plays drums and is only given writing credits for the throw-away, under two minutes twelve bar rocker ‘Modern Times Rock ‘n’ Roll. Queen’s debut album peaked at number 18 in the U.K. Charts, although it was to re-enter the charts again in 1976, on the back of Bohemian Rhapsody’s nine week year spanning run at number one, when all four of Queen’s albums were in the British Top Thirty. ‘Queen 2’ originally released in March 1974, reached number 5; ‘Sheer Heart Attack (1975) reached number 3; and, of course, the icing on the cake, the first of many number 1 albums, ‘A Night At The Opera’, released at Christmas of 1975. After the release of their debut album, Queen went out on the road with Mott the Hoople for two tours of Europe and one of the United States of America. Hopple was the only band they ever played support to. By 1976 they were playing to 200 thousand people in Hyde Park, London, and were the biggest band in the world, where they remained until Freddie’s untimely death in 1991. But it all started here with a debut album that even contained the demo track ‘The Night Comes Down’. Such were the original time constraints on the band. Just kop a look at the cover for signals of what was to come.